LAKEWOOD, New Jersey -- A thick, perpetual mist during a gloomy Thursday night at FirstEnergy Park proved as tricky as a carnival game on the Jersey Shore boardwalk. 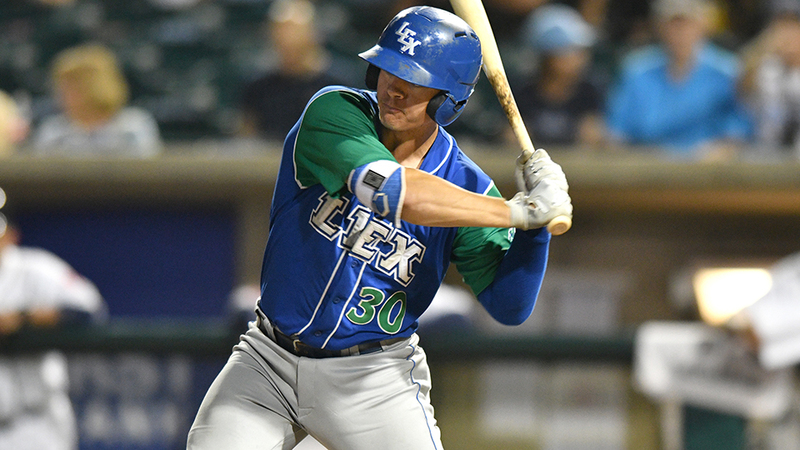 In a contest that featured nine errors Class A Lexington's ever-dependable Nick Pratto has continued to remain consistent in the postseason. The sixth-ranked Royals prospect collected a pair of hits, walked twice and scored a run as the Legends topped the BlueClaws, 6-3, in Game 3 of the best-of-5 South Atlantic League Finals. Pratto has amassed seven hits in 17 at-bats, for a .412 average, with two homers and four RBIs in the playoffs. "[The weather] was something we had to adjust to, for sure," he said. "But that's just how tonight went for both sides. It was something we had to deal with and I think we did I nice job." A 2017 first-rounder out of high school in Huntington Beach, California, Pratto batted .280/.343/.443 with 14 homers, 79 runs, 62 RBIs and 33 doubles over 127 games in his first full season. The 19-year-old first baseman has already compiled three multi-hit games in five postseason contests. "I've just been keeping my process before the game, through the game. Just a consistent approach," said Pratto, who opted to keep the details of his gameplan close to the vest. "Seeing the ball well, so I'm just trying to ride it out and put good swings on balls. ... I'm just really trying to see the ball well and stay within my zone and execute my swing." Lakewood was responsible for five errors in the game against Lexington's four. After drawing a walk in the first inning, Pratto capitalized on a miscue on his third-inning single to right fielder Jhailyn Ortiz, who threw the ball away when fifth-ranked Royals prospect MJ Melendez tried to go from first base to third. The error put Pratto on third and he scored on a sacrifice fly to center from No. 21 Royals prospect Brewer Hicklen. "We knew that [Lakewood starter Andrew Brown] was going to be sinking it a little bit with changeups and two-seamers," said Pratto, making note of his club's aggressive baserunning. "We took advantage of the wetness, put good swings on balls right where we wanted it." The former No. 14 overall pick blooped an infield single to second in the fifth and walked again in the seventh before going down swinging in his final at-bat in the ninth. Kansas City's No. 22 prospect Jeison Guzman added two knocks and plated a run on the Legends' only extra-base hit, a double to left in the second. Fourteenth-ranked Kyle Isbel recorded a pair of singles, a run and an RBI. "I think we're all out here just trying to do our best to help the team," Pratto said. "I think that helps everybody elevate their game, especially myself. Maybe tomorrow it's MJ, maybe the next day, it's Brewer. Everybody is just trying to do their best out there." Royals No. 8 prospect Daniel Lynch got the start for Lexington and yielded two unearned runs on five hits with four strikeouts over four innings. Collin Snider, Daniel Duarte and Tad Ratliff allowed two hits over the final 4 2/3 frames. Duarte struck out four over two innings. Jake Scheiner went 4-for-5, all singles, with two runs scored and Dalton Guthrie doubled and singled for Lakewood. Phillies No. 29 prospect Nick Maton singled and scored a run. The nine errors were committed by eight different players, and the five total were the most made by the BlueClaws this season. Lexington can clinch its first South Atlantic League title with a win in Game 4 on Friday night. First pitch is scheduled for 7:05 p.m. ET.